Minimizing shrink and low commission costs certainly play major roles in the bottom line but ultimately everyone wants to know where the highest market is. The best way that a seller can tell where the highest market is, isn’t by reading market reports that can be “pumped up” but to go watch the sale and see how many buyers are there and how much buyer activity goes on. A sale with only a handful of buyers will not generate the high market prices that a house full of buyers will. This is where East Texas Livestock really pulls away from the pack. The average auction sale in east Texas and Louisiana has 5-8 buyers that sit in week in and week out to bid on cattle. 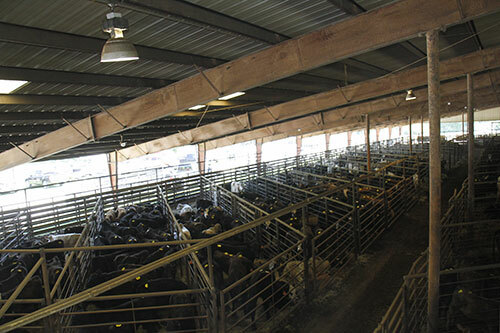 Many auction barn owners are comfortable with that because most all classes of cattle can be covered between those few buyers. We see it differently. East Texas Livestock has, on any given day, an average of 14-17 calf buyers sitting in there bidding and competing for cattle. If only a few buyers are sitting in the sale, the demand isn’t near as strong which results in a cheaper market. Also, as the sale goes on and orders start to get filled, cattle that haven’t sold yet begin to be bought at reduced prices because every buyer is looking to cheapen up the cattle that have previously been bought in the sale. With a house full of buyers this doesn’t happen as often, if at all. Being centrally located, East Texas Livestock has become a hub for all major order buying companies, regional cattle companies, and all local order buyers. Because we have worked on maintaining close relationships with buyers over the past 67 years and we are a fresh cattle sale, buyers can buy with confidence, which results in market setting prices each week. In the recent year we have even attracted buyers as far as Oklahoma that have come in weekly bringing in northern orders that are typically known to be very aggressive. We encourage you to come watch the market and compare the market at East Texas Livestock to any other sale. We believe the difference will speak for itself.